Evenings at Saint Patrick emphasizes enrichment and fun by offering mini courses to the community on a variety of topics including history, the arts, technology, gardening, sports, business, and health. While most are geared for adults, there is a selection of kid-friendly classes including a behind the scenes tour of the Virginia Zoo. Our Evenings program is only possible through the generosity of our course teachers and our parent volunteers who donate their time and talent. 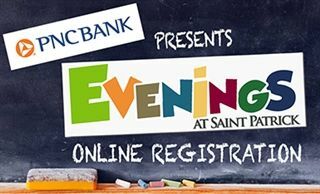 This dynamic program contributes to a larger mission of the school: Evenings proceeds go directly to need-based financial assistance to Saint Patrick Catholic School families.